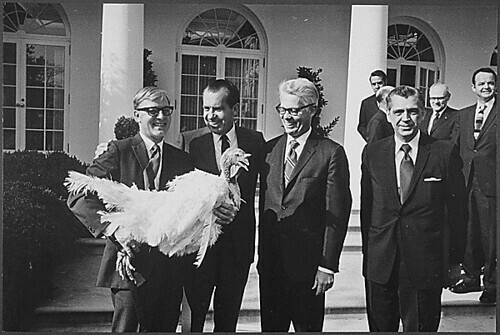 There are two turkeys in this photo that received pardons. Photo from The Commons on Flickr. One of my favorite movies of all time is 'Dirty Rotten Scoundrels'. The tail of two con men competing for dominance on the French Riviera, its a movie that combines beautiful locations, great writing, and two brilliant actors (Michael Caine and Steve Martin) at the top of their game. Another reason I love the movie is that I can relate to Michael Caine’s character so well. I mean, other than the whole conning people out of huge sums of money bit. I won’t go as far to say that I’m talentless, more that I’ve never had enough patience to find where my true talents lie. It’s why writing is generally where I focus my mind. If I rush a painting, I can’t take back those brush strokes. When I worked in a dark room, many a picture turned mediocre when I couldn’t stand waiting another five minutes for chemicals to finish their work. I love to decorate, but inevitably end up with the same old mess once my messy tendencies dominate. However, if I rush or make a mistake while writing, I simply hit the delete key and make some corrections. With the written word, my lack of focus and organization is not an epic, fatal flaw. The world is changing, though, and patience is becoming less of a virtue. Photography, for example, doesn’t necessarily require a dark room any more to succeed. Sure, there’s traditionalists that will cry that digital will never match the hand developed qualities. That may be true, but I’m not going to bother with a darkroom. Technology is my friend, and I’m going to use it. Further, I still possess an itch to write about music, art, and such, even though I thought I long ago burned that sensibility out of my brain. One of my English Professors in college deemed me a “snob” right before graduation. I’m still not sure if he meant that as a criticism or compliment. While I denied it at the time, it’s true. I’m a snob, and I should embrace it, as long as I don’t drive people insane in the process.